If your circuit breaker is constantly tripping and feels hot to the touch, it’s probably overloaded and needs to be replaced. This repair should be undertaken by a trained electrician for the most safety. An electrician can repair your circuit or upgrade to a newer model for better safety and efficiency. Circuit breakers will protect electrical appliances and computers from power surges. They prevent appliances from overheating and possibly catching on fire. They can also trip to prevent electrocution if someone sticks something besides a plug into an outlet. Signs that a circuit breaker needs maintenance include tripping often, hearing sounds of buzzing, hissing or popping coming from the circuit breaker, smelling smoke from the breaker panel, seeing visible damage to such as frayed wires or burnt metal or feeling heat coming from the panel. 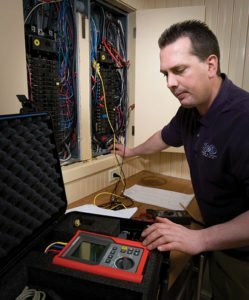 Our electricians can test your circuits to see if any are overloaded or double-tapped. Circuits become overloaded when too many electrical appliances are used on the same circuit. Double tapped circuits have two wires connected to the same screw or terminal in the panel. This is a problem if the breaker is designed only for one wire. They can also check for a short or ground fault in your wiring. Our licensed electricians provide service in Maryland, Delaware, Washington, DC and Virginia. Contact us for details or to get your project started.